The telecommunications industry faces the problem of providing telephone services to rural areas, where the customer base is small, but the cost of installing a wired phone network is very high. One method of reducing the high infrastructure cost of a wired system is to use a fixed wireless radio network. The problem with this is that for rural and urban areas, large cell sizes are required to obtain sufficient coverage. This results in problems cased by large signal path loss and long delay times in multipath signal propagation. Currently Global System for Mobile telecommunications (GSM) technology is being applied to fixed wireless phone systems in rural areas or Australia. However, GSM uses Time Division Multiple Access (TDMA), which has a high symbol rate leading to problems with multipath causing inter-symbol interference. Several techniques are under consideration for the next generation of digital phone systems, with the aim of improving cell capacity, multipath immunity, and flexibility. These include Code Division Multiple Access (CDMA) and Coded Orthogonal Frequency Division Multiplexing (COFDM). Both these techniques could be applied to providing a fixed wireless system for rural areas. However, each technique has different properties, making it more suited for specific applications. COFDM is currently being used in several new radio broadcast systems including the proposal for high definition digital television, Digital Video Broadcasting (DVB) and Digital Audio Broadcasting (DAB). However, little research has been done into the use of COFDM as a transmission method for mobile telecommunications systems. With CDMA systems, all users transmit in the same frequency band using specialized codes as a basis of channelization. The transmitted information is spread in bandwidth by multiplying it by a wide bandwidth pseudo random sequence. Both the base station and the mobile station know these random codes that are used to modulate the data sent, allowing it to de-scramble the received signal. OFDM/COFDM allows many users to transmit in an allocated band, by subdividing the available bandwidth into many narrow bandwidth carriers. Each user is allocated several carriers in which to transmit their data. The transmission is generated in such a way that the carriers used are orthogonal to one another, thus allowing them to be packed together much closer than standard frequency division multiplexing (FDM). This leads to OFDM/COFDM providing a high spectral efficiency. The expansion of the use of digital networks has led to the need for the design of new higher capacity communications networks. The demand for cellular-type systems in Europe is predicted to be between 15 and 20 million users by the year 2000 , and is already over 30 million (1995) in the U.S. . Wireless services have been growing at a rate greater than 50% per year , with the current second-generation European digital systems (GSM) being expected to be filled to capacity by the early 2000’s. The telecommunications industry is also changing, with a demand for a greater range of services such as video conferencing, Internet services, and data networks, and multimedia. This demand for higher capacity networks has led to the development of third generation telecommunications systems. One of the proposed third generation telecommunications systems is the Universal Mobile Telecommunications System (UMTS), which aims to provide a more flexible data rate, a higher capacity, and a more tightly integrated service, than current second generation mobile systems. This section focuses on the services and aims of the UMTS. Other systems around the world are being developed, however many of these technologies are expected to be eventually combined into the UMTS. The World Wide Web (WWW) has become an important communications media, as its use has increased dramatically over the last few years. This has resulted in an increased demand for computer networking services. In order to satisfy this, telecommunications systems are now being used for computer networking, Internet access and voice communications. A WWW survey revealed that more then 60% of users access the Internet from residential locations , where the bandwidth is often limited to 28.8kbps . This restricts the use of the Internet, preventing the use of real time audio and video capabilities. Higher speed services are available, such as integrated-services digital network (ISDN). These provide data rates up to five times as fast, but at a much-increased access cost. This has led to the demand of a more integrated service, providing faster data rates, and a more universal interface for a variety of services. The emphasis has shifted away from providing a fixed voice service to providing a general data connection that allows for a wide variety of applications, such as voice, Internet access, computer networking, etc. The increased reliance on computer networking and the Internet has resulted in demand for connectivity to be provided “any where, any time”, leading to an increase in the demand for wireless systems. This demand has driven the need to develop new higher capacity, high reliability wireless telecommunications systems. The development and deployment of third generation telecommunication systems aim to overcome some of the downfalls of current wireless systems by providing a high capacity, integrated wireless network. There are currently several third generation wireless standards, including UMTS, cdmaOne, IMT 2000, and IS-95 . 1.1.1 Evolution of Telecommunication Systems. Many mobile radio standard have been developed for wireless systems throughout the world, with more standards likely to emerge. Most first generations systems were introduced in the mid 1980’s, and can be characterized by the use of analog transmission techniques, and the use of simple multiple access techniques such as Frequency Division Multiple Access (FDMA). First generation telecommunications systems such as Advanced Mobile Phone Service (AMPS)  only provided voice communications. They also suffered from a low user capacity, and security problems due to the simple radio interface used. Second generation systems were introduced in the early 1990’s, and all use digital technology. This provided an increase in the user capacity of around three times . This was achieved by compressing the voice waveforms before transmission . Third generation systems are an extension on the complexity of second-generation systems and will begin roll out of services sometime after the year 2001. The capacity of third generation systems is expected to be over ten times original first generation systems. This is going to be achieved by using complex multiple access techniques such as CDMA, or an extension of TDMA, and by improving flexibility of services available. Table 1 and Table 2 show some of the major cellular mobile phone standards in North America and Europe. Figure 1 shows the evolution of current services and networks to the aim of combining them into a unified third generation network. Many currently separate systems and services such as radio paging, cordless telephony, satellite phones, private radio systems for companies etc, will be combined so that all these services will be provided by third generation telecommunications systems. The main aims of the Universal Mobile Telecommunications System is to provide a more unified high capacity network, in wireless and wired environments. UMTS will enable fixed and wireless services to converge. There are to be three main channel capacity connections: a mobile rate of 144kbps; a portable rate of 384kbps and an in-building rate of 2Mbps . It will have the capacity to provide services and features requiring less then 2Mbps that would otherwise have been provided with a fixed network. UMTS must therefore provide on-demand, variable bandwidth allocation. It will also combine a range of applications including cordless phones, cellular phones, and mobile data networking for personal, business and residential use. Many services have been identified for the UMTS, which can be categorized based on the data rate required, quality of service (reliability and allowable bit error rate (BER)), real time transfer rate. 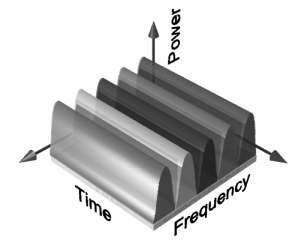 Each of the services has different characteristics in terms of delay tolerance and allowable bit error rates. Table 3 shows characteristics for some of the UMTS services. Web browsing As high as possible (>10kbps-100kbps) High (BER < 1e-9) Depends on material. Generally not time critical. The data characteristics will determine the most suitable transmission methods. The type of data associated with each service determines the type of environment in which the service can be supported. The aim of the UMTS systems is to provide an “any where, any time” service, thus the operating environment will vary depending on the user location. The environment in which the wireless system must operate affects the system capacity and type of services that can be provided. Table 4 lists some of the environments in which UMTS will be required to provide coverage. Table 4 Maximum supported data rates for UMTS, for various environments. The maximum supported data rate for each environment is related to the cell size required to provide adequate coverage for the environment. A cellular network is required to ensure the UMTS can provide a high capacity network. As with any cellular system, the total capacity of the network is dependent on the size of the cells used. The smaller the cells are made, the larger the total capacity. However, the cell size is limited by the amount of infrastructure. The cell size also determines the maximum channel capacity for each cell, as propagation effects, such as multipath delay spread and high path loss, force large cells to have a lower data rate. Large cells also have to service a large number of users, and since the cell capacity is approximately fixed, each user can only have a reduced data rate, with respect to a smaller cell. In order to optimise the cellular network three cell types are used. These are the pico-cell, micro cell, and macro-cell. The three different cell types trade off cell size will total capacity and services. Table 5 shows the three cell types used in the UMTS system and some of the cell characteristics. The size and type of coverage of each cell type effects the radio propagation problems that will be encountered. This will determine the most suitable radio transmission technique to use. One of the aims identified for UMTS is to provide a wireless interface comparable to wired connections. The requirement to provide wide band services up to 2Mb/s, with flexible, on demand allocation of transmission capacity in a large range of radio environments, will call for a revolution in the radio access techniques used. The radio interface is currently undergoing substantial research, with the relative performance of CDMA and TDMA being investigated . Currently CDMA appears to be the most likely candidate for supporting the high data rate required. However, other techniques such as COFDM and hybrid solutions may also be appropriate for UMTS. One of the aims of the UMTS is to provide access “any where, any time”. However, cellular networks can only cover a limited area due to the high infrastructure costs. For this reason, satellite systems will form an integral part of the UMTS network. Satellites will be able to provide an extended wireless coverage to remote areas and to aeronautical and maritime mobiles. The level of integration of the satellite systems with the terrestrial cellular networks is under investigation. A fully integrated solution will require mobiles to be dual mode terminals that would allow communications with orbiting satellites and terrestrial cellular networks. Low Earth Orbit (LEO) satellites are the most likely candidates for providing worldwide coverage. Currently several low earth orbit satellite systems are being deployed for providing global telecommunications. These include the Teledesic System, which is scheduled to begin operation by the end of 2002 with 288 satellites , to provide high bandwidth two-way communications to virtually anywhere in the world. However, the Teledesic System will not be able to meet even 20% of the demand , thus the need for broadband wireless networks. (Addendum, 10/2001: Current estimates put the release date of the Teledesic System sometime in 2005, see www.teledesic.com). Across the globe, each region is moving to make third generation systems happen. Japan is looking at having a system up and running by year 2001. This is driven by the very high demand for mobile communications, which has been so great that their second-generation cellular networks are starting to run out of capacity . It is expected that Europe will have a wide band CDMA system by the year 2005 . The U.S. is expected to implement a third generation system somewhere from 2000 to 2010 . Manufacturers are creating several standards to meet requirements in each sector of the world. To date, the majority of systems are based on CDMA standards. Before infrastructure rolls out, third generations will be developed on a regional basis. This process is being guided by the International Telecommunications Union’s (ITU) effort to create the IMT 2000 standard. ITU will produce the IMT 2000 standard by the year 2000, with the aim of combining the regional systems into a unified standard . Future communications will be driven by the need to provide a more integrated high capacity, wide coverage service. For the 21st century user there should ideally be no distinction in service capability between mobile or fixed network access. This will be achieved using a variety of technologies including satellite communications, advanced radio networking techniques, and high speed fixed networks. In an ideal radio channel, the received signal would consist of only a single direct path signal, which would be a perfect reconstruction of the transmitted signal. However in a real channel, the signal is modified during transmission in the channel. The received signal consists of a combination of attenuated, reflected, refracted, and diffracted replicas of the transmitted signal. On top of all this, the channel adds noise to the signal and can cause a shift in the carrier frequency if the transmitter, or receiver is moving (Doppler effect). Understanding of these effects on the signal is important because the performance of a radio system is dependent on the radio channel characteristics. Attenuation is the drop in the signal power when transmitting from one point to another. It can be caused by the transmission path length, obstructions in the signal path, and multipath effects. Figure 2 shows some of the radio propagation effects that cause attenuation. Any objects that obstruct the line of sight signal from the transmitter to the receiver can cause attenuation. Shadowing of the signal can occur whenever there is an obstruction between the transmitter and receiver. It is generally caused by buildings and hills, and is the most important environmental attenuation factor. Shadowing is most severe in heavily built up areas, due to the shadowing from buildings. However, hills can cause a large problem due to the large shadow they produce. Radio signals diffract off the boundaries of obstructions, thus preventing total shadowing of the signals behind hills and buildings. However, the amount of diffraction is dependent on the radio frequency used, with low frequencies diffracting more then high frequency signals. Thus high frequency signals, especially, Ultra High Frequencies (UHF), and microwave signals require line of sight for adequate signal strength. To over come the problem of shadowing, transmitters are usually elevated as high as possible to minimise the number of obstructions. Typical amounts of variation in attenuation due to shadowing are shown in Table 6. 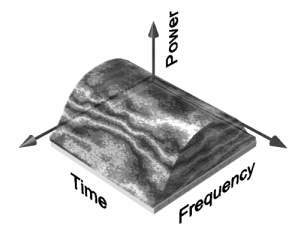 Shadowed areas tend to be large, resulting in the rate of change of the signal power being slow. For this reason, it is termed slow-fading, or log-normal shadowing. In a radio link, the RF signal from the transmitter may be reflected from objects such as hills, buildings, or vehicles. This gives rise to multiple transmission paths at the receiver. Figure 3 show some of the possible ways in which multipath signals can occur. 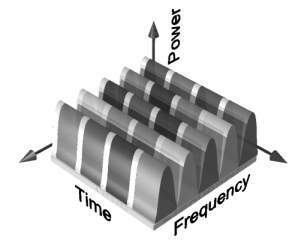 The relative phase of multiple reflected signals can cause constructive or destructive interference at the receiver. This is experienced over very short distances (typically at half wavelength distances), thus is given the term fast fading. These variations can vary from 10-30dB over a short distance. Figure 4 shows the level of attenuation that can occur due to the fading. The Rayleigh distribution is commonly used to describe the statistical time varying nature of the received signal power. It describes the probability of the signal level being received due to fading. Table 7 shows the probability of the signal level for the Rayleigh distribution. In any radio transmission, the channel spectral response is not flat. It has dips or fades in the response due to reflections causing cancellation of certain frequencies at the receiver. Reflections off near-by objects (e.g. ground, buildings, trees, etc) can lead to multipath signals of similar signal power as the direct signal. This can result in deep nulls in the received signal power due to destructive interference. For narrow bandwidth transmissions if the null in the frequency response occurs at the transmission frequency then the entire signal can be lost. This can be partly overcome in two ways. By transmitting a wide bandwidth signal or spread spectrum as CDMA, any dips in the spectrum only result in a small loss of signal power, rather than a complete loss. Another method is to split the transmission up into many small bandwidth carriers, as is done in a COFDM/OFDM transmission. The original signal is spread over a wide bandwidth and so nulls in the spectrum are likely to only affect a small number of carriers rather than the entire signal. The information in the lost carriers can be recovered by using forward error correction techniques. The received radio signal from a transmitter consists of typically a direct signal, plus reflections off objects such as buildings, mountings, and other structures. The reflected signals arrive at a later time then the direct signal because of the extra path length, giving rise to a slightly different arrival times, spreading the received energy in time. Delay spread is the time spread between the arrival of the first and last significant multipath signal seen by the receiver. In a digital system, the delay spread can lead to inter-symbol interference. This is due to the delayed multipath signal overlapping with the following symbols. This can cause significant errors in high bit rate systems, especially when using time division multiplexing (TDMA). Figure 5 shows the effect of inter-symbol interference due to delay spread on the received signal. As the transmitted bit rate is increased the amount of inter-symbol interference also increases. The effect starts to become very significant when the delay spread is greater then ~50% of the bit time. Table 8 shows the typical delay spread for various environments. The maximum delay spread in an outdoor environment is approximately 20 us, thus significant inter-symbol interference can occur at bit rates as low as 25 kbps. Inter-symbol interference can be minimized in several ways. One method is to reduce the symbol rate by reducing the data rate for each channel (i.e. split the bandwidth into more channels using frequency division multiplexing, or OFDM). Another is to use a coding scheme that is tolerant to inter-symbol interference such as CDMA. When a wave source and a receiver are moving relative to one another the frequency of the received signal will not be the same as the source. When they are moving toward each other the frequency of the received signal is higher then the source, and when they are approaching each other the frequency decreases. This is called the Doppler effect. An example of this is the change of pitch in a car’s horn as it approaches then passes by. This effect becomes important when developing mobile radio systems. Where Df is the change in frequency of the source seen at the receiver , fo is the frequency of the source, v is the speed difference between the source and transmitter, and c is the speed of light. This shift of 55Hz in the carrier will generally not effect the transmission. However, Doppler shift can cause significant problems if the transmission technique is sensitive to carrier frequency offsets (for example OFDM) or the relative speed is higher (for example in low earth orbiting satellites). Multiple access schemes are used to allow many simultaneous users to use the same fixed bandwidth radio spectrum. In any radio system, the bandwidth that is allocated to it is always limited. For mobile phone systems the total bandwidth is typically 50 MHz, which is split in half to provide the forward and reverse links of the system. Sharing of the spectrum is required in order increase the user capacity of any wireless network. FDMA, TDMA and CDMA are the three major methods of sharing the available bandwidth to multiple users in wireless system. There are many extensions, and hybrid techniques for these methods, such as OFDM, and hybrid TDMA and FDMA systems. However, an understanding of the three major methods is required for understanding of any extensions to these methods. For systems using Frequency Division Multiple Access (FDMA), the available bandwidth is subdivided into a number of narrower band channels. Each user is allocated a unique frequency band in which to transmit and receive on. During a call, no other user can use the same frequency band. Each user is allocated a forward link channel (from the base station to the mobile phone) and a reverse channel (back to the base station), each being a single way link. The transmitted signal on each of the channels is continuous allowing analog transmissions. The channel bandwidth used in most FDMA systems is typically low (30kHz) as each channel only needs to support a single user. FDMA is used as the primary subdivision of large allocated frequency bands and is used as part of most multi-channel systems. Figure 6 and Figure 7 shows the allocation of the available bandwidth into several channels. Time Division Multiple Access (TDMA) divides the available spectrum into multiple time slots, by giving each user a time slot in which they can transmit or receive. Figure 8 shows how the time slots are provided to users in a round robin fashion, with each user being allotted one time slot per frame. TDMA systems transmit data in a buffer and burst method, thus the transmission of each channel is non-continuous. The input data to be transmitted is buffered over the previous frame and burst transmitted at a higher rate during the time slot for the channel. TDMA can not send analog signals directly due to the buffering required, thus is only used for transmitting digital data. TDMA can suffer from multipath effects as the transmission rate is generally very high, resulting in significant inter-symbol interference. TDMA is normally used in conjunction with FDMA to subdivide the total available bandwidth into several channels. This is done to reduce the number of users per channel allowing a lower data rate to be used. This helps reduce the effect of delay spread on the transmission. Figure 9 shows the use of TDMA with FDMA. Each channel based on FDMA, is further subdivided using TDMA, so that several users can transmit of the one channel. This type of transmission technique is used by most digital second generation mobile phone systems. For GSM, the total allocated bandwidth of 25MHz is divided into 125, 200kHz channels using FDMA. These channels are then subdivided further by using TDMA so that each 200kHz channel allows 8-16 users . Code Division Multiple Access (CDMA) is a spread spectrum technique that uses neither frequency channels nor time slots. With CDMA, the narrow band message (typically digitised voice data) is multiplied by a large bandwidth signal that is a pseudo random noise code (PN code). All users in a CDMA system use the same frequency band and transmit simultaneously. The transmitted signal is recovered by correlating the received signal with the PN code used by the transmitter. Figure 10 shows the general use of the spectrum using CDMA. · Signal hiding and non-interference with existing systems. For many years, spread spectrum technology was considered solely for military applications. However, with rapid developments in LSI and VLSI designs, commercial systems are starting to be used. Where BWRF is the transmitted bandwidth after the data is spread, and BWinfo is the bandwidth of the information data being sent. Figure 11 shows the process of a CDMA transmission. The data to be transmitted (a) is spread before transmission by modulating the data using a PN code. This broadens the spectrum as shown in (b). In this example the process gain is 125 as the spread spectrum bandwidth is 125 times greater the data bandwidth. Part (c) shows the received signal. This consists of the required signal, plus background noise, and any interference from other CDMA users or radio sources. The received signal is recovered by multiplying the signal by the original spreading code. This process causes the wanted received signal to be despread back to the original transmitted data. However, all other signals that are uncorrelated to the PN spreading code become more spread. The wanted signal in (d) is then filtered removing the wide spread interference and noise signals. Figure 11 Basic CDMA transmission. CDMA is achieved by modulating the data signal by a pseudo random noise sequence (PN code), which has a chip rate higher then the bit rate of the data. The PN code sequence is a sequence of ones and zeros (called chips), which alternate in a random fashion. Modulating the data with this PN sequence generates the CDMA signal. The CDMA signal is generated by modulating the data by the PN sequence. The modulation is performed by multiplying the data (XOR operator for binary signals) with the PN sequence. Figure 12 shows a basic CDMA transmitter. The PN code used to spread the data can be of two main types. A short PN code (typically 10-128 chips in length) can be used to modulate each data bit. The short PN code is then repeated for every data bit allowing for quick and simple synchronization of the receiver. Figure 13 shows the generation of a CDMA signal using a 10-chip length short code. Alternatively a long PN code can be used. Long codes are generally thousands to millions of chips in length, thus are only repeated infrequently. Because of this they are useful for added security as they are more difficult to decode. Walsh codes are orthogonal, which means that the dot product of any two rows is zero. This is due to the fact that for any two rows exactly half the number of bits match and half do not. Each row of a Walsh matrix can be used as the PN code of a user in a CDMA system. By doing this the signals from each user is orthogonal to every other user, resulting in no interference between the signals. However, in order for Walsh codes to work the transmitted chips from all users must be synchronized. If the Walsh code used by one user is shifted in time by more than about 1/10 of chip period, with respect to all the other Walsh codes, it looses its orthogonal nature resulting in inter-user interference. This is not a problem for the forward link as signals for all the users originate from the base station, ensuring that all the signal remain synchronized. The reverse link is different to the forward link because the signals from each user do not originate from a same source as in the forward link. The transmission from each user will arrive at a different time, due to propagation delay, and synchronization errors. Due to the unavoidable timing errors between the users, there is little point in using Walsh codes as they will no longer be orthogonal. For this reason, simple pseudo random sequences are typically used. These sequences are chosen to have a low cross correlation to minimise interference between users. The capacity is different for the forward and the reverse links because of the differences in modulation. The reverse link is not orthogonal, resulting in significant inter-user interference. For this reason the reverse channel sets the capacity of the system. Orthogonal Frequency Division Multiplexing (OFDM) is a multicarrier transmission technique, which divides the available spectrum into many carriers, each one being modulated by a low rate data stream. OFDM is similar to FDMA in that the multiple user access is achieved by subdividing the available bandwidth into multiple channels, which are then allocated to users. However, OFDM uses the spectrum much more efficiently by spacing the channels much closer together. This is achieved by making all the carriers orthogonal to one another, preventing interference between the closely spaced carriers. Coded Orthogonal Frequency Division Multiplexing (COFDM) is the same as OFDM except that forward error correction is applied to the signal before transmission. This is to overcome errors in the transmission due to lost carriers from frequency selective fading, channel noise and other propagation effects. For this discussion the terms OFDM and COFDM are used interchangeably, as the main focus of this thesis is on OFDM, but it is assumed that any practical system will use forward error correction, thus would be COFDM. In FDMA each user is typically allocated a single channel, which is used to transmit all the user information. The bandwidth of each channel is typically 10 kHz-30 kHz for voice communications. However, the minimum required bandwidth for speech is only 3 kHz. The allocated bandwidth is made wider then the minimum amount required to prevent channels from interfering with one another. This extra bandwidth is to allow for signals from neighbouring channels to be filtered out, and to allow for any drift in the centre frequency of the transmitter or receiver. In a typical system up to 50% of the total spectrum is wasted due to the extra spacing between channels. This problem becomes worse as the channel bandwidth becomes narrower, and the frequency band increases. Most digital phone systems use vocoders to compress the digitised speech. This allows for an increased system capacity due to a reduction in the bandwidth required for each user. Current vocoders require a data rate somewhere between 4-13kbps , with depending on the quality of the sound and the type used. Thus each user only requires a minimum bandwidth of somewhere between 2-7 kHz, using QPSK modulation. However, simple FDMA does not handle such narrow bandwidths very efficiently. TDMA partly overcomes this problem by using wider bandwidth channels, which are used by several users. Multiple users access the same channel by transmitting in their data in time slots. Thus, many low data rate users can be combined together to transmit in a single channel that has a bandwidth sufficient so that the spectrum can be used efficiently. There are however, two main problems with TDMA. There is an overhead associated with the change over between users due to time slotting on the channel. A change over time must be allocated to allow for any tolerance in the start time of each user, due to propagation delay variations and synchronization errors. This limits the number of users that can be sent efficiently in each channel. In addition, the symbol rate of each channel is high (as the channel handles the information from multiple users) resulting in problems with multipath delay spread. OFDM overcomes most of the problems with both FDMA and TDMA. OFDM splits the available bandwidth into many narrow band channels (typically 100-8000). The carriers for each channel are made orthogonal to one another, allowing them to be spaced very close together, with no overhead as in the FDMA example. Because of this there is no great need for users to be time multiplex as in TDMA, thus there is no overhead associated with switching between users. The orthogonality of the carriers means that each carrier has an integer number of cycles over a symbol period. Due to this, the spectrum of each carrier has a null at the centre frequency of each of the other carriers in the system. This results in no interference between the carriers, allowing then to be spaced as close as theoretically possible. This overcomes the problem of overhead carrier spacing required in FDMA. Each carrier in an OFDM signal has a very narrow bandwidth (i.e. 1 kHz), thus the resulting symbol rate is low. This results in the signal having a high tolerance to multipath delay spread, as the delay spread must be very long to cause significant inter-symbol interference (e.g. > 100 msec). To generate OFDM successfully the relationship between all the carriers must be carefully controlled to maintain the orthogonality of the carriers. For this reason, OFDM is generated by firstly choosing the spectrum required, based on the input data, and modulation scheme used. Each carrier to be produced is assigned some data to transmit. The required amplitude and phase of the carrier is then calculated based on the modulation scheme (typically differential BPSK, QPSK, or QAM). The required spectrum is then converted back to its time domain signal using an Inverse Fourier Transform. In most applications, an Inverse Fast Fourier Transform (IFFT) is used. The IFFT performs the transformation very efficiently, and provides a simple way of ensuring the carrier signals produced are orthogonal. The Fast Fourier Transform (FFT) transforms a cyclic time domain signal into its equivalent frequency spectrum. This is done by finding the equivalent waveform, generated by a sum of orthogonal sinusoidal components. The amplitude and phase of the sinusoidal components represent the frequency spectrum of the time domain signal. The IFFT performs the reverse process, transforming a spectrum (amplitude and phase of each component) into a time domain signal. An IFFT converts a number of complex data points, of length that is a power of 2, into the time domain signal of the same number of points. Each data point in frequency spectrum used for an FFT or IFFT is called a bin. The orthogonal carriers required for the OFDM signal can be easily generated by setting the amplitude and phase of each frequency bin, then performing the IFFT. Since each bin of an IFFT corresponds to the amplitude and phase of a set of orthogonal sinusoids, the reverse process guarantees that the carriers generated are orthogonal. Figure 14 shows the configuration for a basic OFDM transmitter and receiver. The signal generated is at base-band and so to generate an RF signal the signal must be filtered and mixed to the desired transmission frequency. One of the most important properties of OFDM transmissions is its high level of robustness against multipath delay spread. This is a result of the long symbol period used, which minimises the inter-symbol interference. The level of multipath robustness can be further increased by the addition of a guard period between transmitted symbols. The guard period allows time for multipath signals from the pervious symbol to die away before the information from the current symbol is gathered. The most effective guard period to use is a cyclic extension of the symbol. If a mirror in time, of the end of the symbol waveform is put at the start of the symbol as the guard period, this effectively extends the length of the symbol, while maintaining the orthogonality of the waveform. Using this cyclic extended symbol the samples required for performing the FFT (to decode the symbol), can be taken anywhere over the length of the symbol. This provides multipath immunity as well as symbol time synchronization tolerance. As long as the multipath delay echoes stay within the guard period duration, there is strictly no limitation regarding the signal level of the echoes: they may even exceed the signal level of the shorter path! The signal energy from all paths just add at the input to the receiver, and since the FFT is energy conservative, the whole available power feeds the decoder. If the delay spread is longer then the guard interval then they begin to cause inter-symbol interference. However, provided the echoes are sufficiently small they do not cause significant problems. This is true most of the time as multipath echoes delayed longer than the guard period will have been reflected of very distant objects. Other variations of guard periods are possible. One possible variation is to have half the guard period a cyclic extension of the symbol, as above, an the other half a zero amplitude signal. This will result in a signal as shown in Figure 15. Using this method the symbols can be easily identified. This possibly allows for symbol timing to be recovered from the signal, simply by applying envelop detection. The disadvantage of using this guard period method is that the zero period does not give any multipath tolerance, thus the effective active guard period is halved in length. It is interesting to note that this guard period method has not been mentioned in any of the research papers read, and it is still not clear whether symbol timing needs to be recovered using this method. (Errata Note 10/2001: The best method for guard period implementation to use a cyclic extension of the transmitted symbol over the entire guard period interval, rather than only half of the guard period as described above).